Kyle Hauck is the Southern Region owner and head waterfowl guide. 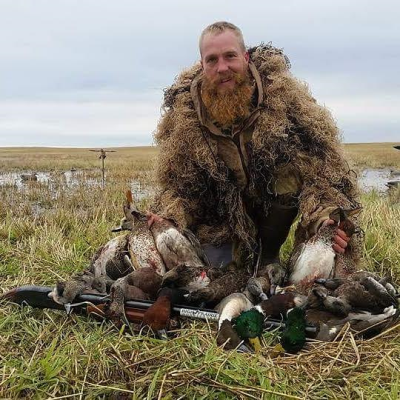 Kyle is also a member of Ducks Unlimited, Rocky Mountain Elk, Wild Turkey Federation, Saskatchewan Outfitters Association, and many other wildlife organizations, making him a qualified South Dakota and Saskatchewan Hunting Guide. Kyle holds a degree in Biology and Earth Science. Whether tracking wolves in Minnesota, hunting ducks from Saskatchewan all the way down to Arkansas or guiding a true Merriam turkey hunt in the Black Hills of South Dakota, Kyle is an avid outdoors-man. His training skills allow him to work with people of all ages. With a hard-working, go-to attitude and a commitment to satisfy his customers day in and day out, a guarantee is that you will find enjoyment and Kyle will take his reward in putting you on the game! We will put you on the game!